The Forbidden City is the imperial palace of the Ming and Qing dynasties. The construction of the Forbidden City began in 1406 and lasted for 14 years, employing (according to some estimates) more than a million men. The main axis of the new building was located east of the Yuan Dynasty palaces, a fact not random because in doing so those buildings were to be found to the west of the new building (the area of ​​death, according to Feng shui). The ground excavated during the construction of the moat surrounding the Forbidden City was brought back to the north, where it became a veritable artificial hill. The complex consists of 980 buildings divided into 8,707 rooms, making it the largest palace in the world. The palace complex exemplifies sumptuous traditional Chinese architecture, and has influenced the cultural and architectural developments of East Asia. In 1987 the Forbidden City was included in the UNESCO World Heritage List, which recognizes it as the largest collection of old wooden structures that has survived to this day. Since 1925, the Forbidden City has become a museum, whose vast collection of works of art and artefacts has been created thanks to the imperial collections of the Ming and Qing dynasties. The site where the Forbidden City stands today was part of the imperial city already during the Yuan Dynasty. When the Ming Dynasty succeeded her, the Emperor. Between 1420, the year of completion, and 1644, the Forbidden City was the seat of the Ming Dynasty until it was invaded during the peasant revolt led by Li Zicheng, who was proclaimed emperor of the Shun dynasty. In October, the Manchus had achieved supremacy in the north of China and a ceremony held at the Forbidden City announced the young emperor Shunzhi as ruler of all China under the Qing dynasty. The Qing emperors changed the names of some of the main buildings in order to emphasize "harmony" rather than supremacy, they produced two-language inscriptions (Chinese and Manchu), and introduced shamanic elements into the palace. Also later the Qing dynasty held here the headquarters of Chinese political power. Pu Yi remained in the Forbidden City until 1924, when Feng Yuxiang took control of Beijing by a coup, expelling the former emperor. 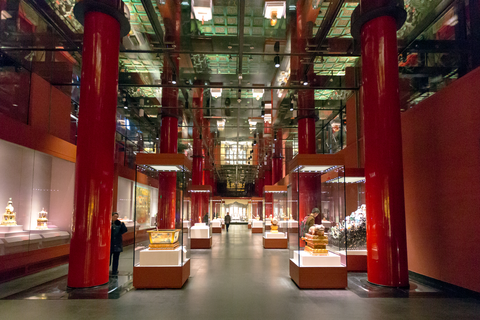 Shortly thereafter, the national museum of the palace was established, displaying the numerous treasures collected by the emperors in the five centuries in which they had dominated China. During the Second Sino-Japanese War, the security of such treasures was endangered and were then reported to the Forbidden City. Part of the collection was then returned at the end of the Second World War. Scholars believe that the axis was designed during the Yuan dynasty to be aligned with Xanadu, the other capital of their empire.